As innocent Pakistani civilians are hit yet again, this time in Wah, by the mindless and ruthless Taliban, Pakistan's clueless leadership continues its now familiar infighting. While I fully expect them to escape-goat Musharraf and the military once again for this latest outrage involving the massacre of over 70 people, the fact remains that these inept politicians will now have a much harder time justifying blaming someone else. They are now fully in charge and they must accept responsibility for the security and well being of all Pakistani citizens. To paraphrase former US president Harry S. Truman, "the buck stops at Zardari's desk". 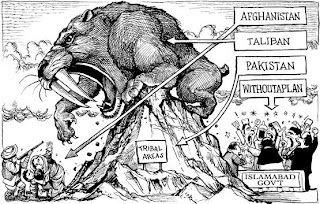 While the world must hold Messrs Zardari and Sharif responsible, I believe it is time for all Pakistanis to stop being ambivalent about the Taliban and join the fight against them. The Taliban perpetrating these atrocities in the name of Islam are criminals and thugs. They are no friends of Islam, Muslims or Pakistan and they must be stopped, not for America’s sake, but for the sake of Pakistan. The anti-American attitudes in Pakistan must not be allowed in get in the way of fighting the terrorists who target innocent Pakistani civilians to achieve their nefarious political aims. Please read my post about the Taliban's atrocities to get the full picture of Taliban’s ambitions and the ineptitude of our current leadership. Let’s not be blind to the wave of deadly suicide bombings in Pakistan and the rest of the world unleashed by your jihadist friends who have killed large numbers of innocent, nameless, faceless people, mainly Muslims, and innocent civilians of other faiths. Let us not be blind to the threats issued by your Lal Masjid friends to Najam Sethi recently and many more media men and women in the past. Let us not be blind to the broadcast threats of your radical Lal Masjid friends who threatened to throw acid in the un-veiled faces of Muslim women in Islamabad during their reign of terror. Let us not be blind to the desecration of mosques in Pakistan by your friends who turned them into arms and ammunition depots and launch pads for vicious attacks against fellow Muslims who disagreed with their extreme interpretation of Sharia. Let us not be blind to those who are trying to impose their violent version of Shariah by the force of arms. Let us not be blind to the atrocities Taliban and Al-Qaeda and their sympathizers have committed against the poor Aghans during their short rule and later, particularly against the weak including women and girls whose schools have been shut down or burned down. or the barber shops which have been shut or burned down for shaving men’s facial hair. Let us not be blind to the fact that any one, including Musharaf ( and I admit he is no angel) , who challenged your extremist friends engaged in violence against fellow Muslims, has become the object of hate by you. Let us not be blind to the to the fact that your radical “Islamic” friends have done more to damage the name and perception of Islam and Muslims than any one else in the history of the world. i totally condemn this shameful act of ruthless terrorism. btw i was surprised to see that things haven't stirred up on the blogger.pk after the blast in DI Khan and now in Wah. I have lived in the taliban regime of nwfp for almost a year in Lachi, a town 45km down stream of Kohat. things are really confusing there. americans too are operatin inside pakistan. to me mehsud is an american agent on the payroll of cia. that's why he was liberated from camp x-ray to spread violence in pakistan. New World Order, is a reality. For past twenty years, the State of Pakistan has been supporting the extremists for their own cause. The tragedy is that the Frankenstein has turned against the people of Pakistan instead of Pakistan's enemy. The people of Pakistan kept silent when these extremists were causing mayhem on innocent citizens of other countries. These barbarians have caused immense pain for vast amount of innocent people. All I can say that the chickens have come home to roost. These chickens were once celebrated as God's beloved warrior by the Pakistani nation, what a tragedy. While I concede your basic point, I also sense that you are enjoying the pain being inflicted on your fellow human beings. You see this as payback. Unfortunately, many right-wing fanatics within Pakistan seem to share the same joy that you experience when you see his murder and mayhem on the streets of Pakistan. This is indeed a sad day for all of humanity, regardless of religion, ethnicity or nationality. I hope ..larger Pak public as well as other nationalities who have a soft corner for cause of Al-Queda-Taliban, though they may not like their means employed in its entirety..urgently grasps the situation they are in and understands the ulterior designs of these extremists.They are not doing any of these out of love to anyone or compassion.The overwhelming motive is revenge and hate for their alleged "oppressor" victims.Its time to execute war on terrorism for Pak than thinking it's a war of US. Riaz: Unfortunately, many right-wing fanatics within Pakistan seem to share the same joy that you experience when you see his murder and mayhem on the streets of Pakistan. The ambivalence of many Pakistanis to the Taliban is puzzling to this outsider. Speaks of conflicted loyalties - Islam or Pakistan. If they are broadly looked upon as apnay log then Pakistan has an intractable - and quite possibly, fatal, problem. No counter-insurgency will ever work without local support. The only course that may work is ruthless military operation followed by all-out "charm attacks" to win over hearts and minds over the long haul. The TTP have been remarkably clever; they have sown fresh tensions in the country between Punjab and elsewhere. They have shown themselves able to attack almost at will with a single-minded determination to influence Pakistan’s elections. The TTP spokesman was even quoted by Pakistan’s Express Tribune as citing European philosophers, when he said elections were contrary to Pakistan’s Islamic values. “The two are contrary to each other because Islamic laws and values come from Allah Almighty, while the secular doctrine comes from Rousseau, Kant and Bentham.” They are not just angry tribesmen riled up by drones. They have a plan. And Pakistan, no matter how many nameless children among the dead, does not.